The songs are accessed by clicking on a letter on the above nav-bar, A for songs beginning A etc. See below for full titles list . This collection includes nearly 3000 scores with sheet music and mandolin tabs for traditional Irish music. GDAE (standard) tuning for the mandolin is assumed, note that this is also a common banjo tuning. The versions here are not intended to represent any particular version or performance and are provided for educational purposes only. As with most traditional music, a process know as "folk processing" occurs, which can result in many different versions of songs and tunes, so you may find more than one version of a song. Note that we also have this same collection with TAB and sheet music for guitar. 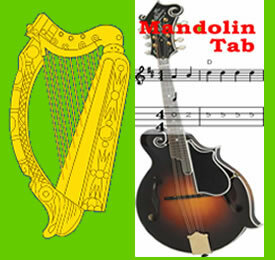 For Irish Mandolin books and sheet music to buy check the Irish Mandolin Collection at Sheet Music Plus. Multi page scores: Some of these tunes are quite long and may extend to 2 or 3 pages, in these cases only the first page is displayed on the web page so to view all the pages you will need to view the PDF file for that song, see below. Listen to the tune: Each tune is provided with a link to a midi file so you can hear what the tune sounds like. PRINT OUT: Should you need a print-out of the song, PDF versions (without banners or adverts) are available from the link at the bottom of each song page. Available songs in this section, to view the songs choose the a letter A, B etc from the nav-bar at the top of this page. Ladies Step Up To Tea!